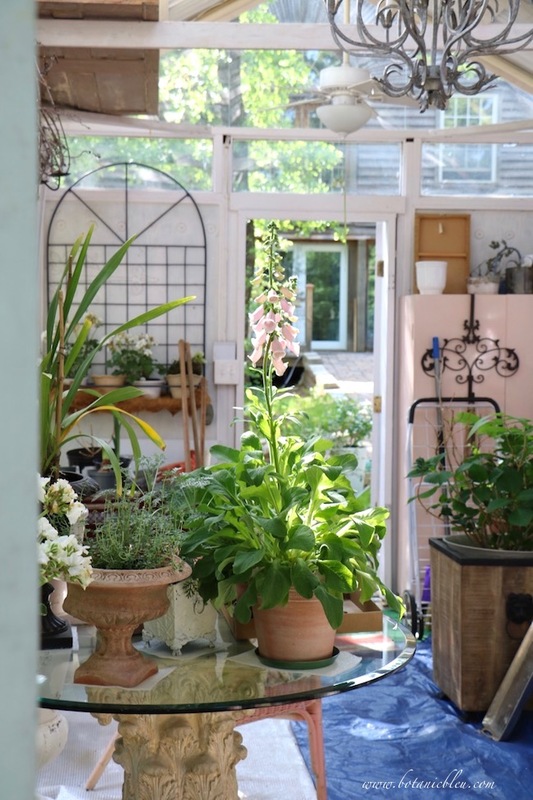 When you daydream of a perfect greenhouse, do you see old pots, reclaimed glass French doors, chippy cabinets, brick floor, baskets, and foxgloves growing in sunlight? 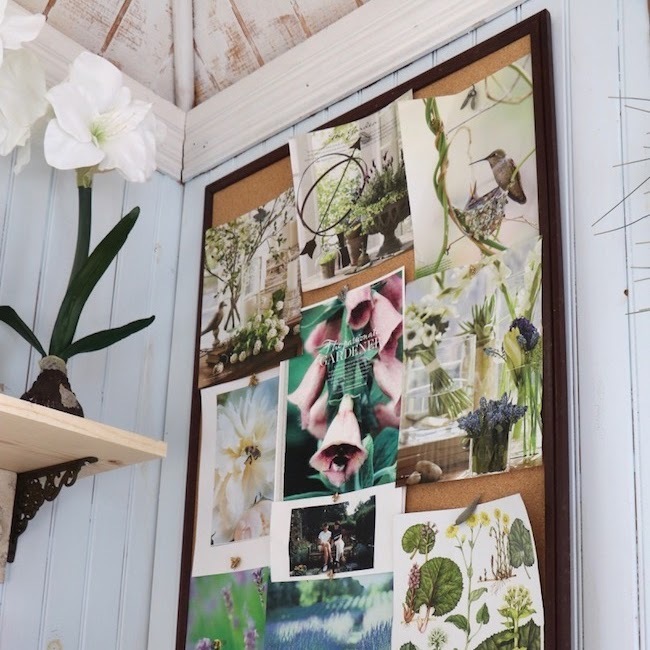 A rustic retreat filled with a jumble of clay pots, potting soil, seedlings, and watering cans scattered about in disarray on weathered wood shelves? Or do you see deep burgundy painted walls, white shelves, a carved pedestal with a glass top, plants in French urns, and a chandelier? 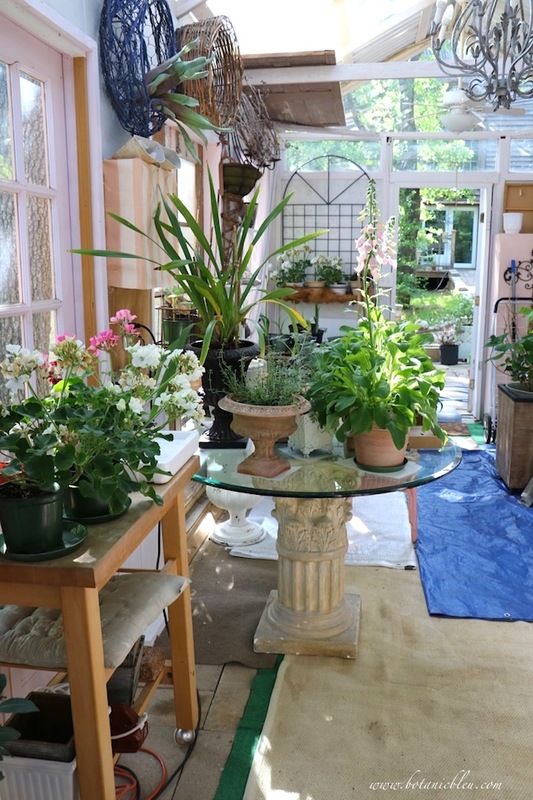 Not so much rustic, but rather a working space in a well-worn gentil (genteel) French florist greenhouse? 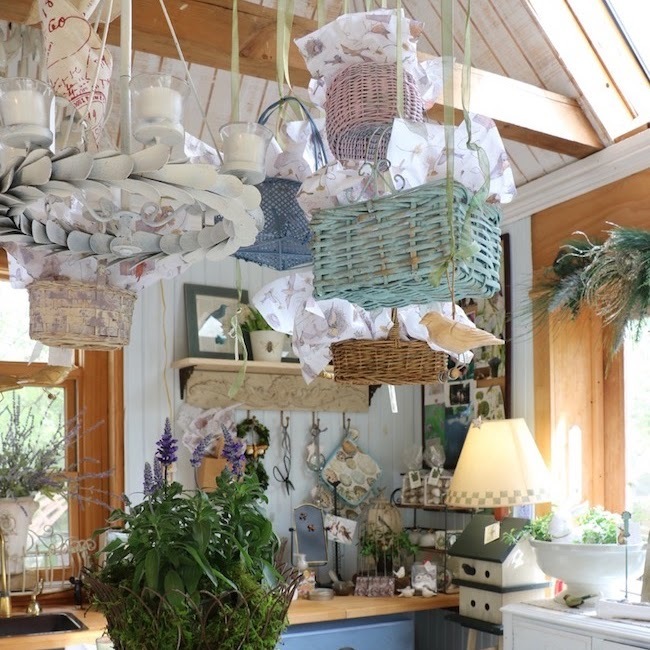 Welcome to my sister's greenhouse, a mixture of rustic retreat and a French gentil florist greenhouse. 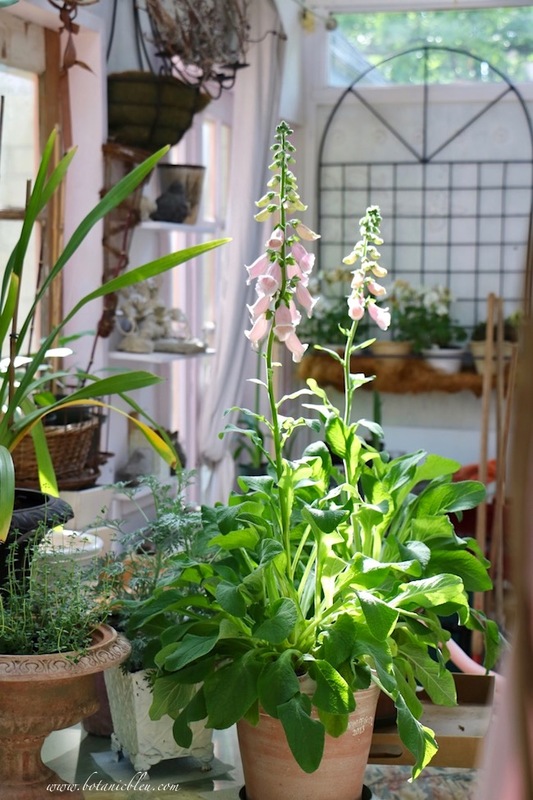 A space where potted hydrangeas and ivy topiaries over-winter, but also a space where spring foxgloves live an elegant French life. 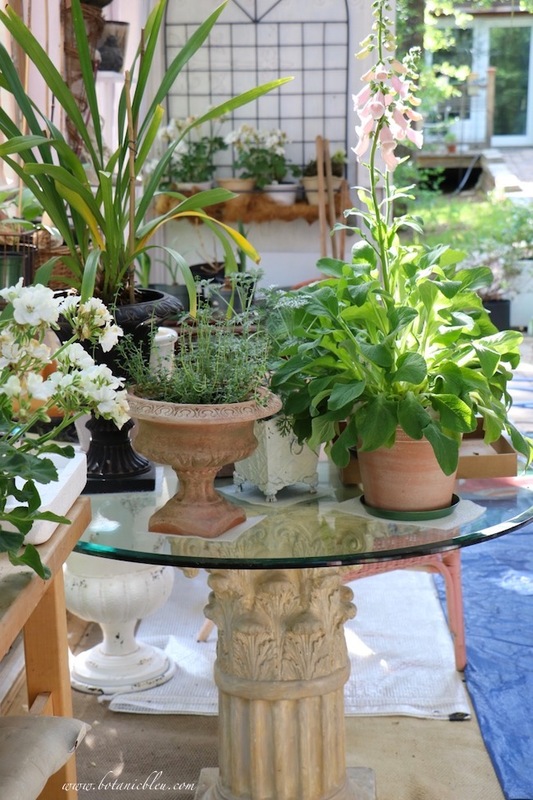 Thyme, foxgloves, and a recovering plant live on a glass-topped concrete pedestal table. Look only within the greenhouse, not out the doors to the surrounding Texas yard, and you could be in a French florist shop. Visible above your head is a portion of a large chandelier. 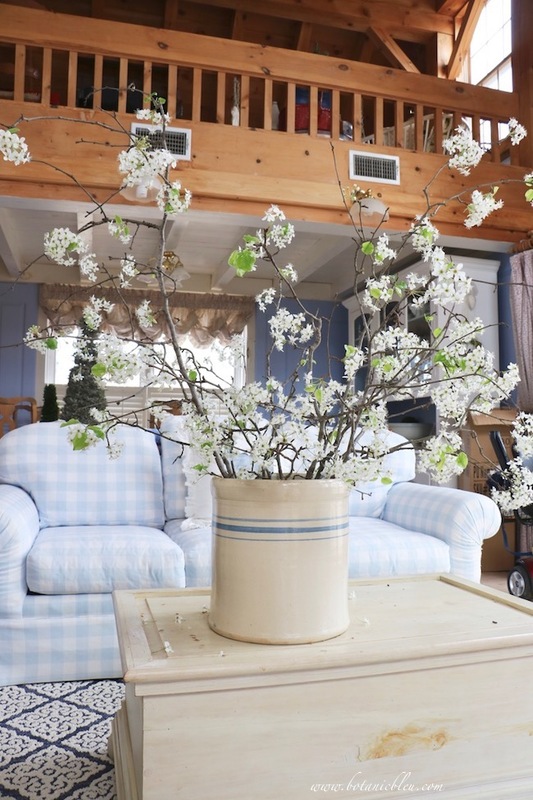 On the floor to the right is a weathered wooden planter box holding a hydrangea. Baskets hang high on the left wall. 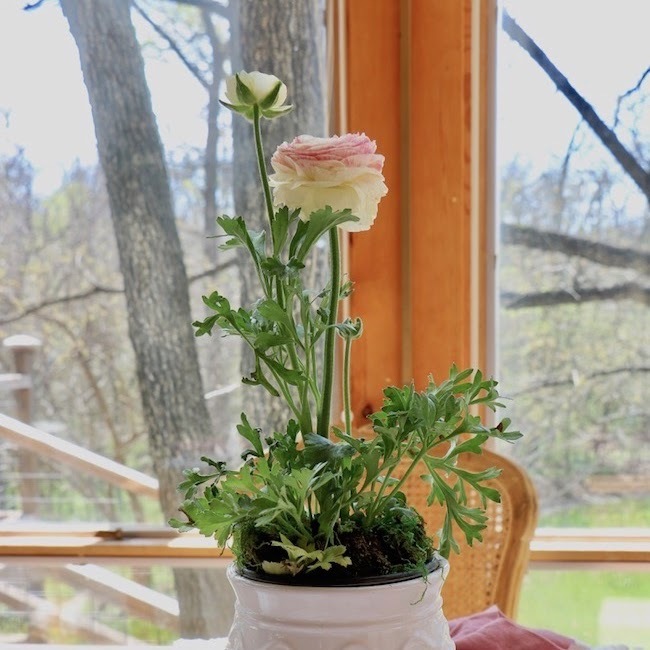 Pink and white geraniums sit on a butcher block kitchen cart. Visible through the open greenhouse door is a view of the French doors on the east deck of the house. Out the opposite end of the greenhouse is a view of a deck made from reclaimed redwood deck boards. Spilled potting soil and starter plants in plastic pots line the deck. Beyond is a view of a small garden area bordered by a stand of native trees in a wooded area. Inside the greenhouse you can see the dark burgundy wall, floating white wood shelves, a drop cloth curtain panel, and some of the reclaimed windows and doors from which the greenhouse was made. Foxgloves cannot withstand the searing Texas summer temperatures. They are sold in our local garden centers in early spring, but usually do not survive the summer. We enjoy them as potted annuals, not as biennials that reseed themselves. In the greenhouse, you can see up close the details of the speckled throats and hairy edges of the petals. 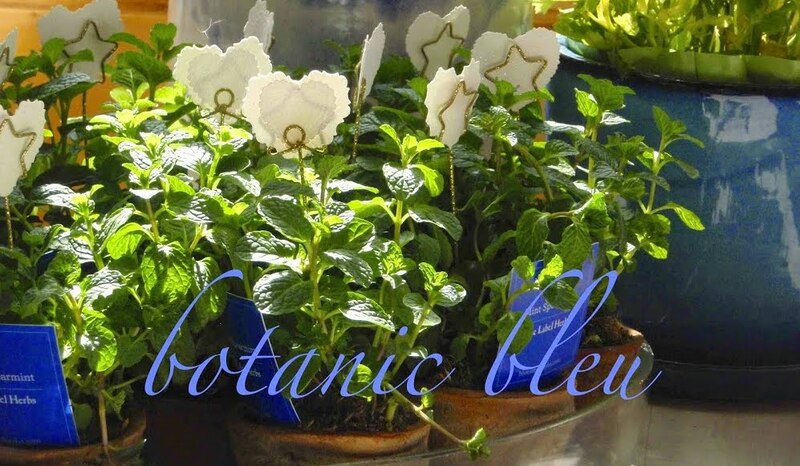 As potted plants, they last longer than a cut floral arrangement. Which makes them worth the cost of the plants to me. 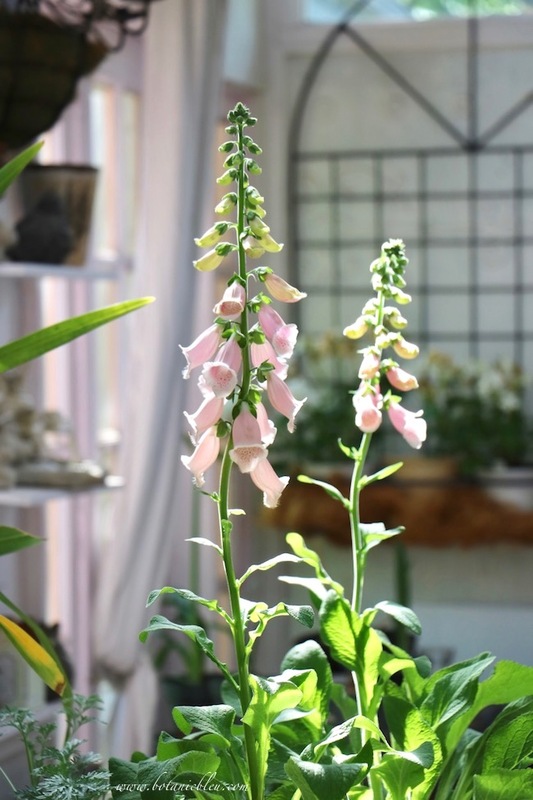 Courtney of French Country Cottage shared 8 Things To Know About Foxgloves and beautiful photos of foxgloves growing in her country garden. This view in my sister's greenhouse is in front of one of the sets of peach French doors and reminds me of beautiful French florist shops. My sister and I have been fortunate to travel together to France many times. We always visit florist shops. If you travel to France, I recommend you pop into florist shops, too. Their styling and presentation of flowers is different from the usual florist shops here in the United States. You will be rewarded with seeing beautiful flowers and smelling heavenly fragrances. I also recommend you buy a bouquet of flowers for your hotel room during your stay in France. Having fresh flowers is one way to experience French country living. 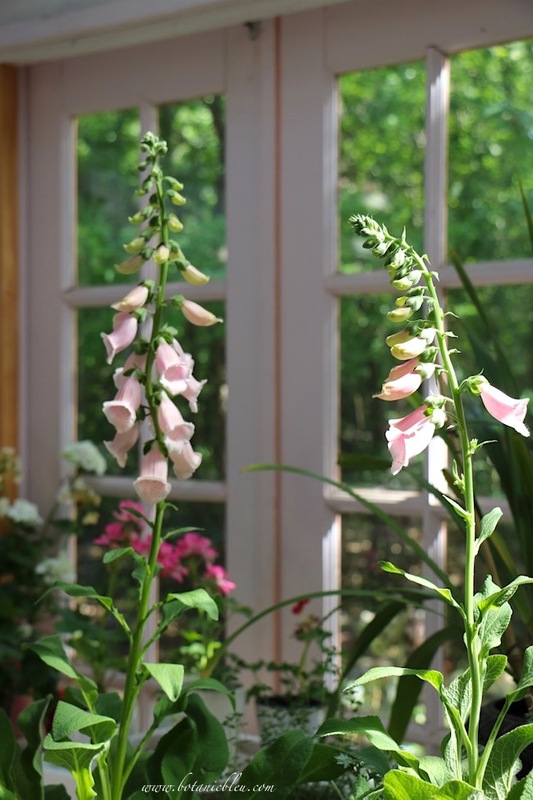 If you daydream about a greenhouse, you may also want to add a little French country style by including some graceful potted foxgloves on a glass-topped pedestal table. And, a chandelier hanging from the ceiling . . .
What do you dream of including in your greenhouse? 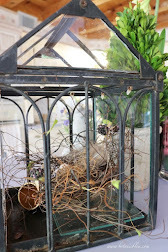 If you would like to see more beautiful flowers, see my Pinterest board, Country French Flowers. Lovely greenhouse. 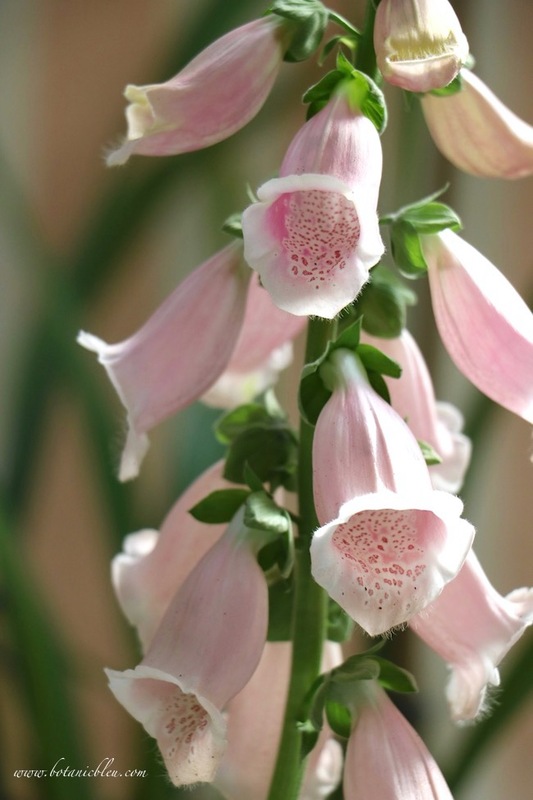 I adore Foxgloves and used to have them as annuals every spring but they became hard to find. Hoping to change that. They are delightful flowers. I enjoyed seeing your sister's greenhouse. Having a greenhouse would be a delight. Both of you have excellent taste. I do fantasize about having a greenhouse but must be realistic and it probably won't happen. Hearing about your France trips are always enjoyable. Some years it is easier to find foxgloves in our area; other years few can be found. I will let me sister know you enjoyed seeing her greenhouse. Keep dreaming. You never know what tomorrow may bring. I'm dreaming of another trip to France . . . during the Christmas season. Yes I definitely dream of a greenhouse and foxgloves. Have you seen the stands of foxgloves at the Dallas Arboretum? They are stunning! I haven't seen the foxgloves at the Dallas Arboretum. I can only imagine how beautiful they must be. The Dallas Arboretum always has stunning floral displays. I would settle for an unFrenchified greenhouse if only I could just HAVE a greenhouse!!! Yes, having a greenhouse would be wonderful! What a beautiful greenhouse that your sister has. I could stay there and meander for quite a while. 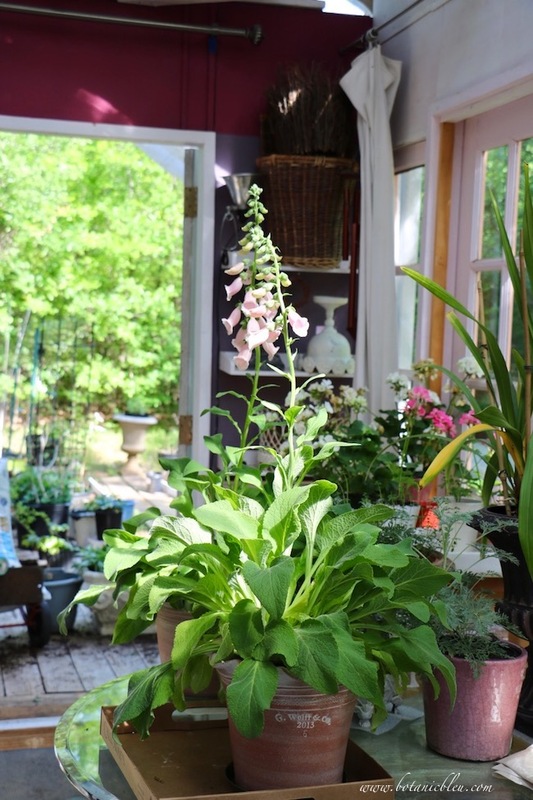 I love foxgloves and in our hot Alabama climate, growing them in pots as an annual is the only way to enjoy them. I would love for you to share this post on my Gardens Galore Link Party on Monday morning 7 a.m. Have a wonderful weekend! Beautiful Judith! Lucky you and your sister get to travel together and see all those florist shops! Love the foxgloves. Great greenhouse of your sisters. Thanks you for sharing her foxgloves. 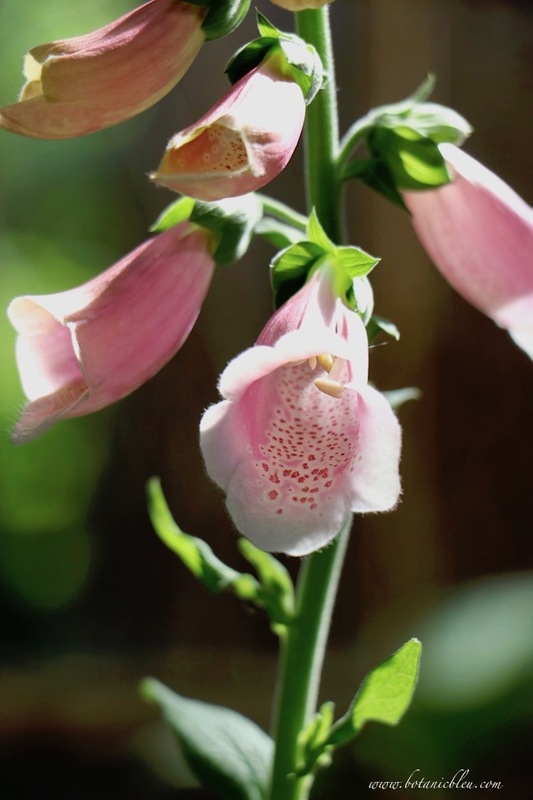 I haven't had a foxglove for a few years but you have me wanting to plan a place in my gardens for some. 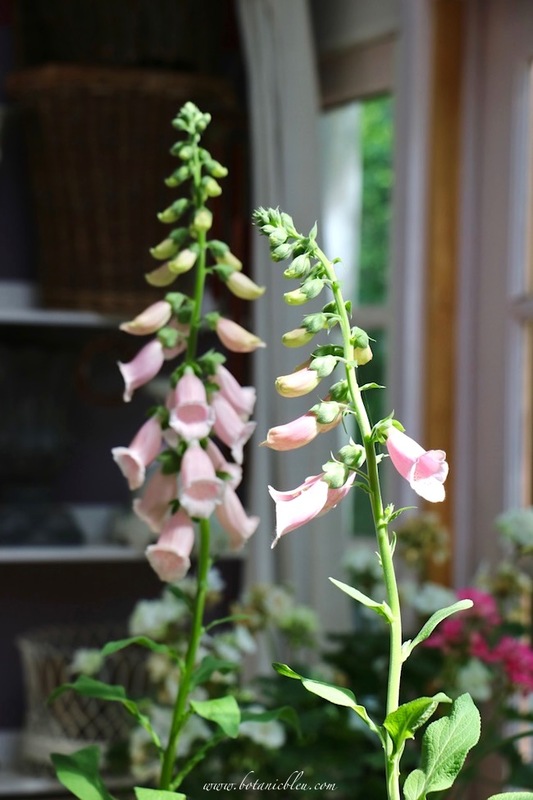 I love foxgloves, and your sister has the magic touch with them! Oh, I do love your sisters greenhouse. What a place to enjoy and those pale pink foxgloves are fabulous. 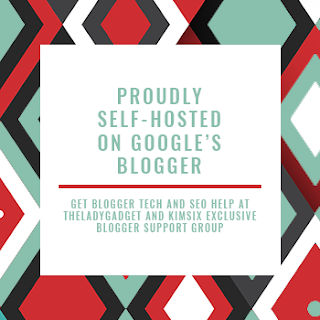 This is my first visit to your blog and it is lovely - hope you will visit me too. 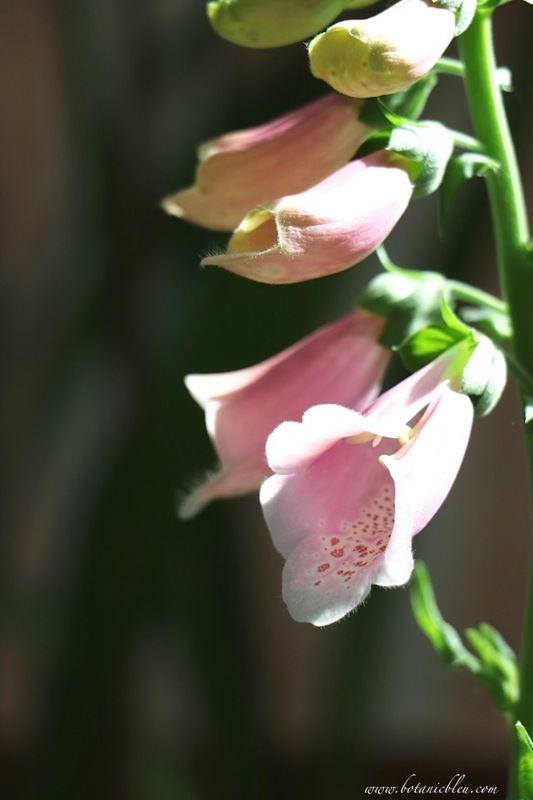 I recently did a post just about foxgloves - https://whereinspirationblooms.com/enchanting-foxgloves/ you may enjoy it. Again, a lovely post and I will return! 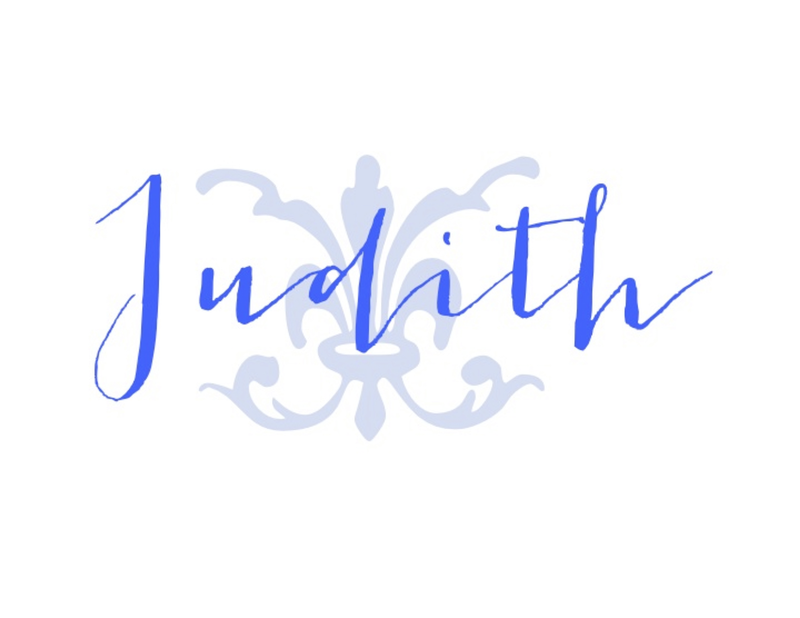 Judith, it is lovely to revisit this post. Thank you for sharing at Gardens Galore! 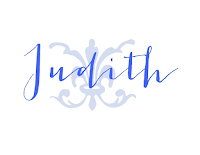 I am so glad that I read this post Judith! I had considered adding foxgloves to the garden as I need more perennial plants. Good to know they won't survive. It seems nothing is really surviving right now. Too hot! Wow what a treat to have your own greenhouse! The foxgloves are always such a treat to see especially when the bees visit and fly in and out of each little flower!